Honouring excellence and innovation in mobile communications, the GSMA is delighted to announce the call for entries to the 18th Annual Global Mobile Awards. The road to winning one of the communication industry’s most coveted prizes begins here, and culminates on the industry’s biggest stage, the Mobile World Congress on Tuesday 26th February 2013, in Barcelona, Spain. iQagent was entered in the new Category “Most Innovative Mobile App“. See GSMA’s website for details and keep your fingers crossed for iQagent! More than 100 product nominations from 65 companies were entered for consideration in this year’s Engineers Choice Awards. Control Engineering subscribers voted to identify the products they felt were the most exceptional based on technological advancement, service to the industry, and market impact. See iQagent’s entry and vote for us online. 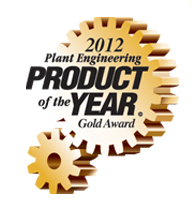 Winners will be identified and notified in mid-February, and the Gold, Silver and Bronze awards in each category, as well as the 2012 Grand Award, will be presented at Plant Engineering’s Product of the Year awards event in March 2013 in Chicago (official invites will be sent out). Winners will also appear in the April 2013 issue of Plant Engineering magazine. Please see our entry page for full details. iQuest was awarded the coveted Customer Excellence award for excellence in integrating Siemens WinCC HMI at Cobb County’s Noonday WRF Facility. Bob Meads, President and CEO of iQuest accepted the award from Richard Myers of Siemens at a special ceremony held at Charlotte’s NASCAR Hall Of Fame on the evening of June 9th. iQuest was nominated for the award by Mike Tiller of Siemens. The WinCC application was a direct conversion from a previous iFix application and was the latest step in Cobb County’s efforts to perform a technology upgrade of their automated systems. The automation system at Noonday already utilized Siemens S7 300 and 400 PLCs; upgrading their older iFix HMI to WinCC allowed them a more robust HMI platform, with greater capabilties for standardization, communication, reporting and scalability. The SQL Server 2005 interface allowed iQuest to quickly import existing tags and alarms from the old system, and to make global changes to naming conventions for tags to facilitate standard faceplates and control screens. VBA was used to automate the generation and configuration of common GUI components, such as gates and valves. The total conversion time for the project was completed on schedule, with minimal issues. New iQuest office opens in Alpharetta, GA.
iQuest announces the Grand Opening of our new Alpharetta, Georgia office. Located at 4385 Kimball Bridge Road, Suite 202, the 2000 square foot facility will allow us to provide more centralized application support for our customers, as well as to expand our WinCC training offerings. We will be publishing a proposed schedule of training events and workshops to be held in our new location in early January, 2010.